Incredibar Toolbar on IE - Boost Your PC. What is Incredibar Toolbar on IE? Incredibar Toolbar is a browser add-on which adds shortcuts to your Internet browsers, there are two variants of this toolbar - one for music related enhancements other for flash games. Incredibar Toolbar by itself is not related to spyware and malware, reasons why this toolbar could be called unwanted include deceptive ads that are shown in mystart.incredibar.com. If you tend to overlook information that is presented in software installation windows then installing Incredibar toolbar will change your homepage to mystart.incredibar.com and default search engine to MyStart. Download Boost and enjoy your PC. Remove Incredibar Toolbar on IE from your PC. 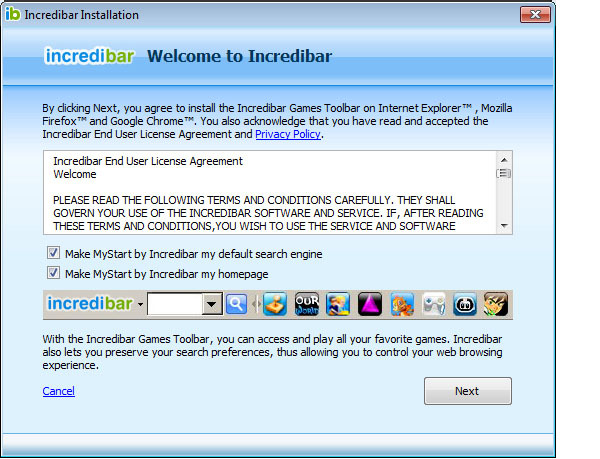 Why should I uninstall Incredibar Toolbar on IE? Removing unwanted toolbars is usually a good idea. Incredibar Toolbar, like other web browser extensions, can potentially have adverse effect on your web browser's and overall PC's performance and stability. This toolbar is known to monitor your search queries and browsing habits in order to send you targeted ads and modify your search settings and results. To the right of the list item, click the Uninstall button and Boost will completely remove Incredibar Toolbar on IE from your PC. Use Add/Remove Programs control panel in Windows makes to uninstall Incredibar Toolbar on IE. Follow the appropriate instructions below to use this control panel. Select Incredibar Toolbar on IE from the list of programs, and click Uninstall. Alternatively, right-click the program and select Uninstall. Select Incredibar Toolbar on IE from the program list, and click Uninstall. Alternatively, right-click the program and select Uninstall. Select Incredibar Toolbar on IE from the list of programs and click Remove. Boost helps you remove Incredibar Toolbar on IE and clean your PC.